Gun violence in America – and finding solutions for gun violence – is a perennial crime problem, and in an effort to end gun violence, every state has a concealed carry law and several gun violence laws. If you receive a charge of violating weapon possession laws around the Seattle area, the Law Offices of Kevin Trombold can examine the particulars of your case, gather evidence and question witnesses, and advocate aggressively for the justice you need and deserve. Experienced Seattle gun crimes attorney Kevin Trombold will fight for your rights and utilize every legal tool that is available on your behalf. If the law in Washington prevents you from owning a gun and you are convicted of having a gun in your possession, the penalties are harsh. If you use a firearm or if weapon violence takes place while you are committing a crime in Washington, and if you are found guilty of that crime, you’ll be punished more harshly because a weapon was used. Washington has a number of different laws that regulate how firearms can be purchased, sold and carried by residents. Washington residents can apply for a concealed carry permit as long as they are not under the age of 21, free on bond or personal recognizance pending trial, appeal or sentencing for a felony, wanted on an outstanding warrant for a felony or misdemeanor crime, a convicted felon, or facing orders from a Washington court to forfeit their firearms. Those who have had a prior concealed carry permit revoked also are not eligible for another permit. If you do not have a concealed carry license, but you are found carrying a concealed firearm either on your body or in your vehicle, you could be charged with a misdemeanor that is punishable by a fine of up to $1,0000 and up to 90 days in jail. Washington prohibits the possession of any firearm while on the property of public or private elementary or secondary schools, school-provided transportation, or other facilities that are being exclusively used by a school. Authorized law enforcement officers of the state or of any county or city may confiscate a firearm from an individual under any of these circumstances mentioned above. If you or a family member or friend has been charged with a gun crime in Washington state, contact an experienced Seattle gun crimes attorney at the Law Offices of Kevin Trombold promptly. For over 20 years, experienced Seattle gun crimes attorney Kevin Trombold has defended scores of clients in the Seattle area who have been charged with a variety of serious gun crimes. Washington’s gun laws are intended to prevent gun violence and protect the victims of violence. However, if the state prohibits you from owning a firearm and you are convicted of a violation, the penalties are considerable. Nevertheless, being charged with a weapon violation is not the equivalent of a conviction, and if have been charged with possessing a firearm illegally, Seattle criminal defense attorney, Kevin Trombold, will be able to examine the details of the case and ensure that the police acted legally and constitutionally. 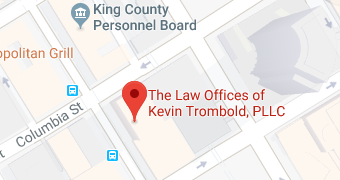 If they didn’t, or if you were mistakenly charged, attorney Kevin Trombold will aggressively fight for justice, all on your behalf. If you’ve been accused of possessing a gun illegally or of committing a crime where a weapon was used, put an experienced criminal defense lawyer to work on your behalf. An experienced and knowledgeable Seattle criminal defense attorney like Kevin Trombold aggressively help to investigate gun crimes and to assist and protect each of their clients. For more than 20 years of experience and a good reputation for legal excellence respected by Seattle-area prosecutors, judges, along with peers, defense attorney Kevin Trombold continuously wins reduced charges, not guilty verdicts, and dismissals. If you receive a charge for a gun crime in or around the Seattle area, call the Law Offices of Kevin Trombold at 206-382-9200.